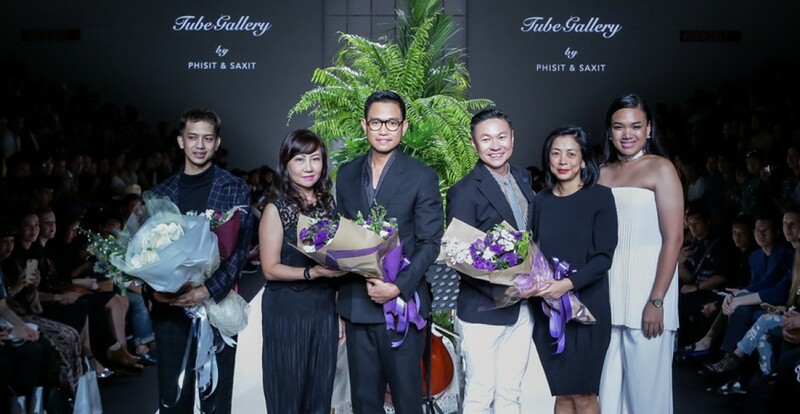 The edgy and prolific Tube Gallery is made up otwodynamic designers Saksit Pisalasupongs and Phisit Jongnarangsin, who have made waves in the fashion scenes of Bangkok and the region. Tube Gallery is about dramatic but yet fun designs, ready-to-wear with a touch of semi couture. They are proud to have showcased their pieces at renowned fashion shows in Bangkok, Kuala Lumpur, Singapore, Jakarta, Beijing, Shanghai, Tokyo, Sydney, and Paris. Tube Gallery has been stocked by leading fashion stores in various countries, from Dubai (UAE), Qatar, Bahrain, Kuwait, Saudi Arabia, Amsterdam (Netherland), USA and London (UK). Numbers of local and international celebrity have been spotted in Tube Gallery dresses which included Kimberley Walsh from Girls Aloud, Ashley Robert from The Pussycat Dolls, A*M*E, Paloma Faith and Stephanie Nala from X Factor UK. The brand was also featured in American Next Top Models, Germany Next Top Models, Thailand Next Top Models, Vietnam Next Top Models and Asia Next Top Models as guest designers as well as guest judges.